When TIME magazine published its extraordinary cover story: The Secret Life of Mother Teresa: Newly published letters reveal a beloved icon's 50-year crisis of faith, it left the Catholic world buzzing. My friends and I could not stop talking about it. As part of the process of canonization as a saint, the Catholic Church investigates all aspects of the candidate: family background, interviews with people who knew and lived and worked with the candidate, homilies and speeches, and many other such examples. Chief among these is the personal journal and writings of the candidate. All this material is being gathered by Father Brian Kolodiejchuk, who is Mother Teresa's postulant for her cause to sainthood. He came across the nun's letters to her confessors and spiritual advisors that she wrote over the course of her half-century career of serving the poor in Calcutta. This correspondence is candid, revealing and breathtaking. Apparently, Mother Teresa was experiencing a crisis of faith for over 50 years, during which time she felt an emptiness in her prayer because she could not feel the presence of God in her life. This seems shocking. The 20th century's most visible icon of faith had a crisis of faith? For over 50 years? Already some media pundits are questioning her worthiness for sainthood. One has to be careful about making a judgment based only on a magazine excerpt or a sound byte from a tabloid television show. Our media-fixated society has a way of rushing to instant judgment about everything, from Paris Hilton to Michael Vick and now to Mother Teresa. Especially on something as important as the process of canonization to sainthood, one should take care to do the hard work of reading the evidence and engaging in conversation about it. In this case, it means taking the time to read the book that features her letters: Mother Teresa: Come Be My Light. Before reading this book, it would be helpful to understand that Church history is filled with saints who experienced what is known as the "dark night of the soul": periods of time when a saint was filled with doubt about God. This period of darkness was often a time of despair and depression, and was experienced by such eventual saints as St. Augustine, St. John of the Cross, and St. Teresa of Avila. The dark night was a time of purging, a step along the way to spiritual ascent. 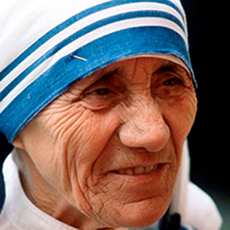 Evidently, Mother Teresa's journey followed the same path. It is too early for me to comment on the full ramifications of Mother Teresa's letters. I only ask fellow seekers to please read them with an open mind, and to refrain from making any hasty judgment about her worthiness to sainthood. I like to think that Mother Teresa now has a new posthumous ministry to those who are in doubt about the existence of God. The pull of atheism and agnosticism is strong in this new millennium. When in doubt about God's presence in the world, let us pray to Blessed Teresa of Calcutta who, despite her own crisis of faith, found a way to bring Christ's light to the poorest of the poor. Tom Booth's lovely song, Fragrance Prayer, is based on a prayer by Mother Teresa that she adapted from the writings of Cardinal Newman. "Dear Jesus, help me to spread your fragrance everywhere that I go. Dear Jesus, flood my soul with your spirit and your love."